Rabbits can handle cold temperatures reasonably well as long as they have a warm, dry shelter. Wild rabbits' warrens stay warm because they are below ground. Since it isn't possible to put your rabbit's hutch underground, you have to take extra precautions to keep it in winter and during cold spells. It's advisable to bring your rabbits inside, or at least into a garage or shed, when the temperature falls below 10 to 15 degrees Fahrenheit, but above these temperatures there are several other methods you can use to keep your rabbit hutch warm. Place a heating pad inside the hutch. You can purchase microwavable pads from a pet or livestock supply company or from a sporting goods store. These pads stay warm for up to 10 hours, are tested for safety, have no wires and are hygienic with no odors. Alternately, you can use a plug-in pad wrapped in a towel or blanket and placed underneath the cage. Check plug-in pads frequently and make sure your pet does not have direct access -- a rabbit will quickly and easily tear through the pad and bite the cords. Plug-in pads can pose a fire and electrocution hazard. 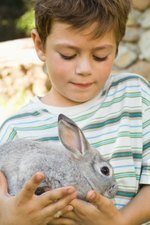 Install heat lamps either outside the cage or covered with wires so your rabbit cannot touch them. Check lamps frequently for burned-out bulbs. Avoid placing heat lamps close to or shining directly on wood, as this can start a fire. Make sure your rabbit cannot access cords and keep them out of contact with water, including rain and snow. Cover the windows of the hutch with wood, plexiglass or Styrofoam with small, several-inch gaps to allow air and light to enter. Put an old carpet or blanket over the hutch and cover it with a tarpaulin to protect against the elements. Raise the hutch above ground level to keep out damp. If it has no legs, place a brick at each corner. Face entrances away from the direction of the wind. If this is not possible, put something in front of the hutch as a wind barrier. Search for damp pieces of wood where there may be damage or leaks. Fix leaks with roof sealant. Insulate your hutch by putting a layer of polystyrene covered with plywood on the inside of the hutch or line the hutch with cardboard, newspaper and lots of straw or hay. Move the hutch into a garage or shed for more warmth, but not if you park your car there, as the fumes can be a health hazard. Use a greenhouse heater to raise the temperature.